Surguja District is well connected to some main cities of Chhattisgarh via road and connecting train route. Jabalpur – Ambikapur Express, Ambikapur – Shahdol, Ambikapur – Surajpur – Anuppur – Bilaspur – Raipur – Durg Express and Bhopal – Chirmiri Passenger run from major cities Bhopal, Gwalior, Katni, Raipur and Jabalpur. Ambikapur is well connected by road to other major cities of Chhattisgarh such as Raipur, Bilaspur, Durg, Bhilai, Korba and Raigarh. Daily bus services also runs for Varanasi, Renukoot in U.P (170 km), Raipur (345 km) and Gadhwa road in Jharkhand (160 km). Bus services from Anuppur to Ambikapur operate via Manendragarh and Surajpur. The bus journeys from Bilaspur and Anuppur take between five and six hours. 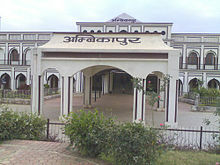 Ambikapur Airport is located 18 km from the city. The nearest airport is Swami Vivekananda Airport, located at Raipur the capital of Chhattisgarh state.